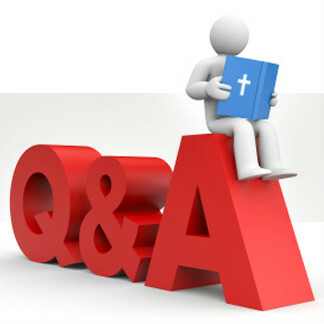 Q&A - Questions We Didn't Get to On Q&A Day: How Can I be Sure? (From a nine year old) How do I make sure I have accepted Christ? 1) I love and long for God’s Word. 2) I have a new awareness of good and evil. Hebrews 5:13-14 - for everyone who lives on milk is unskilled in the word of righteousness, since he is a child. But solid food is for the mature, for those who have their powers of discernment trained by constant practice to distinguish good from evil. 3) I live in repentance. Matthew 3:8 - Bear fruit in keeping with repentance. 4) I have a desire to be like Jesus. Romans 8:29 - For those whom he foreknew he also predestined to be conformed to the image of his Son, in order that he might be the firstborn among many brothers. 5) I am growing more spiritually mature. Philippians 1:6 - And I am sure of this, that he who began a good work in you will bring it to completion at the day of Jesus Christ. 6) I am growing in prayer. Genesis 4:26 - At that time people began to call upon the name of the LORD. 7) My non-Christian friends notice something different about me. 1 Peter 4:3-5 - The time that is past suffices for doing what the Gentiles want to do, living in sensuality, passions, drunkenness, orgies, drinking parties, and lawless idolatry. With respect to this they are surprised when you do not join them in the same flood of debauchery, and they malign you; but they will give account to him who is ready to judge the living and the dead. 8) I love sharing Christ with others. 2 Corinthians 5:20 - Therefore, we are ambassadors for Christ, God making his appeal through us. We implore you on behalf of Christ, be reconciled to God. 9) I love other Christians. 1 John 3:14 - We know that we have passed out of death into life, because we love the brothers. Whoever does not love abides in death. 10) I love giving money to the work of the Lord. Matthew 6:21 - For where your treasure is, there your heart will be also. Biblically, these are objective tests we can use to examine ourselves and see if/how the Holy Spirit is at work in us!